With the aim to bring social reforms in the society in the villages in Choriyasi Taluka & Surat city, KANTHA VIBHAG NAVNIRMAN MANDAL was established in 1965 registered under 1950-Mumbai Public Trust Act-F-142 and 1860-Societies Registration Act –G.U.J. 215->21/05/65 with Shri Chotubhai Narsinhbhai Contractor as the President, who chaired for 13 years & Ratanjibhai Gosaibhai Patel, Thakorbhai Mansukhbhai Patel, Bhagubhai Master, Chotubhai Narsinhbhai Contractor & Ramjibhai Bhanabhai Patel as Trustees. 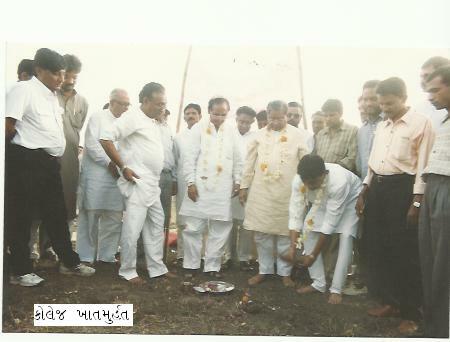 At present Mahendrabhai Ratanjibhai Patel is the President. The word ‘Navnirman’ symbolises ‘Reconstruction’. About 40 years back, the people of this area were economically & socially backward, the literacy rate was very low & there was lack of awareness & education amongst the women. The aim of the trust is to carry various activities for all round upliftment in social, economic, cultural & educational fields without any discriminate of caste, creed or religion. The main aim is to serve the community. With the aim to eradicate the social evils prevailing in the society, whose main cause was lack of education, the trust took up the activities of establishing institutes, to enlighten the minds of people by imparting knowledge & education. The first step in educational field was by starting NAVNIRMAN UTTAR-BUNYADI VIDHYALAYA, Bharthana in 1967, followed by establishing various educational institutes, right from pre-primary to college that too in various faculties, so that there could be an all round development of child, there could be physical, mental, cultural Social development & when the child is out of the institute he is able to earn livelihood & support for himself & his family.